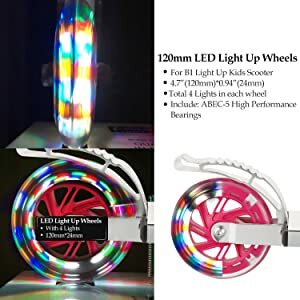 Stand out from the crowd with the special edition Ancheer B2 LED Light Up Wheels Kick Scooter for Kids, with wheels that light up as they spin! Do you spend enough time with your children? Why not choose it as your present for your boys and girls? Although the days with little kids often seem long, the years fly by. Use this practical and colorful light up kick scooter to savor the moments you have together. No batteries required! Motion sensor installed, and lights will switch on when motion is detected, and lights will switch off after your riding. For the Crowed: age in 3-10 years old. Kids scooter suitable for height 90-165 cm population to use. Adjustable in height from 30.7”-32.5”-34”/78cm-82.5cm-87cm. With wider height range, it can grow with them and develop their balance and coordination. Foot Rear brake for extra stopping power, so the light up scooter for kids can protect your kids’ safety. 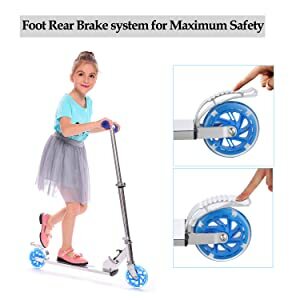 The aluminum handlebars with sponge grips, 120mm PU light up wheels, and enough space kickboard (16.5”*4.2”) provide your boys and girls a smooth and wonderful riding experience, especially, your boys and girls can learn balance and coordination in the safest way. Although the days with little kids often seem long, the years fly by. Use this practical and colorful light up scooter to savor the moments you have together. 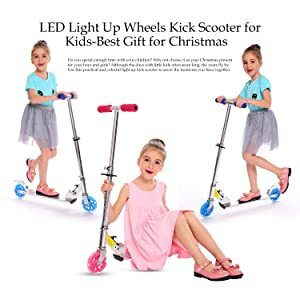 The B2 LED light up kick scooter for kids is the best gift for your boys and girls in their growing life. 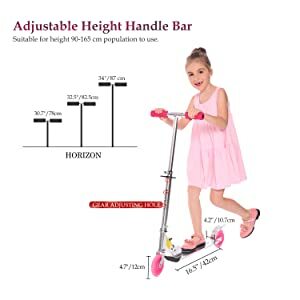 Whatsmore, how about choose one adult scooter for yourself to have fun with your child?